When I traveled to Korea last year, I purchased a slightly absurd quantity of sheet masks (more than half of which are not even in this photo). I've been an adherent of what many American fans would describe as an "Asian," "Asian-inspired," (by which we mean Korean, Japanese, and Taiwanese), or "K-Beauty" skincare routine for almost two years now, and it's been working out well. I once described my routine in very general terms while trying to calculate the hypothetical cost over the course of a year, though the numbers were always a bit off due to price fluctuations and the listed routine is out of date. I also posted a more recent list of products I've used and enjoyed. Today's post focuses on sheet masks, which can often serve as a relatively low-cost and easy to incorporate starter item for those interested in experimenting with Asian skincare. Sheet masks are typically thin sheets of cotton cut to fit around the entire face (with holes for your eyes, nostrils, and mouth) and soaked in moisturizing toner ("lotion" or "essence" in Asian skincare parlance) or lotion ("emulsions" or "milky lotions" in Asian skincare parlance). Hydrogels are also becoming popular. Those are made of thin sheets of solidified gel or jelly, which are still pliable and can fit around the face. Generally, they're more expensive than the traditional cotton sheet masks. I've tried a few hydrogels and I generally find them less moisturizing and, thus, not worth the price. Although I always worry about whether a new sheet mask will break me out or irritate my skin, my acne-prone skin has generally never had trouble with sheet masks. This is despite the fact that they do tend to be scented. I've only had one real dud in all my years of experimenting: the Missha Pure Source sheet masks are terrible. My approach to using sheet masks might be slightly idiosyncratic. I just don't think one is likely to get dramatic results from something that is single-use and sits on your face for around 20 minutes max, so all I expect from my sheet masks is a bit of extra moisturizing and soothing. I imagine that some masks have ingredients that allow for longer-term benefits like brightening up hyperpigmented spots, anti-aging, etc., but I already address those needs with other products in my routine. Thus, one of my main rules for sheet masks is to stick to cheap ones, generally ones that cost less than $2.00/mask. I like to keep a few types in stock at one time because it is fun to switch them around, though that makes noticeable extra benefits besides moisturizing or soothing even less likely. My Beauty Diary (MBD) Imperial Birds Nest, Black Pearl, Hyaluronic Acid, and Aloe Masks: MBD is an extremely popular Taiwanese brand and they make a wide range of sheet masks. The listed varieties are ones that I've tried and loved, though I'm also reasonably confident that any other variety of MBD masks would be reasonably effective and unlikely to break out most skin types. In the past, people worried a lot about getting counterfeits, but in my experience, each of the Amazon sellers I've tried (CP Cosmetics and G-Market) have sent me legitimate ones. They do update their packaging and change how the masks are cut very frequently, and the boxes and mask shape can differ depending on whether it was made for the US or Taiwanese market, so don't be too freaked out if yours look different from someone else's. One thing to be aware of, however, is that they've started cutting their masks extremely small, at least in Taiwan, such that the mask barely fits and leaves about a quarter to half inch of uncovered face all around. I do have a slightly bigger than average face, maybe, but I've never had that problem with any other brand of sheet mask. Innisfree It's Real Squeeze Masks: These are an update to the Innisfree It's Real masks that are also on Amazon. The main option here is to buy a mixed set of 15, and it is unfortunate that you don't get to pick and choose, but I've liked every single mask in this set after buying it around three times over the years. A few of these masks (the Shea Butter for sure, and maybe the Manuka Honey) are soaked with what a US user would describe as lotion, rather than the more typical liquid toner, which might not suit oily skin types as well. Dermal Snail and Pearl Masks: I actually got my first set of Dermal masks from a friend who visited Korea. They're a little cheaper than the other two brands . As with the MBD masks, I'm listing the varieties I've tried, though I'm reasonably confident that other varieties will have similar good results and be well-tolerated by most skin types. I will say that they feel a little less moisturizing than either the MBD or Innisfree masks I mentioned above, so these are not my favorite, though they're a good "starter" sheet mask. Have you tried sheet masks before? Which ones do you enjoy? I'm thinking of ordering a set of Tony Moly masks from Amazon once I've worked through more of the pile I brought home from Korea and Taiwan last summer. 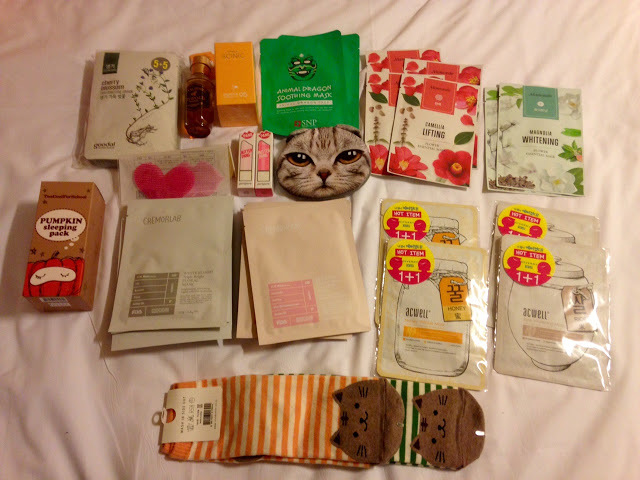 Dorigamii has also ordered Tony Moly and Etude House sheet mask sets from from Amazon, and you can read about her experience here.